This post is the following part #2 of the previous one - in fact Vadim's comments bring me in some doubts about the possible radical difference in implementation of AIO vs normal I/O in Linux and filesystems. 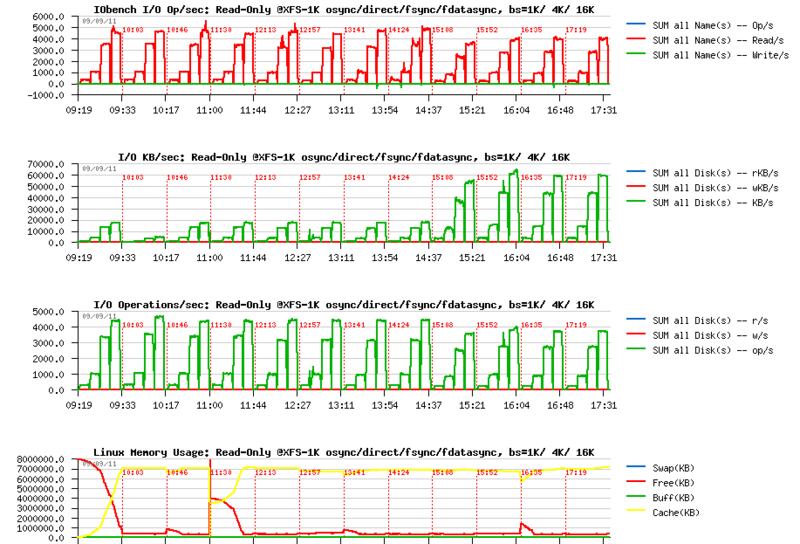 As well I've never used Sysbench for I/O testing until now, and was curious to see it in action. From the previous tests the main suspect point was about random writes (Wrnd) performance on a single data file, so I'm focusing only on this case within the following tests. 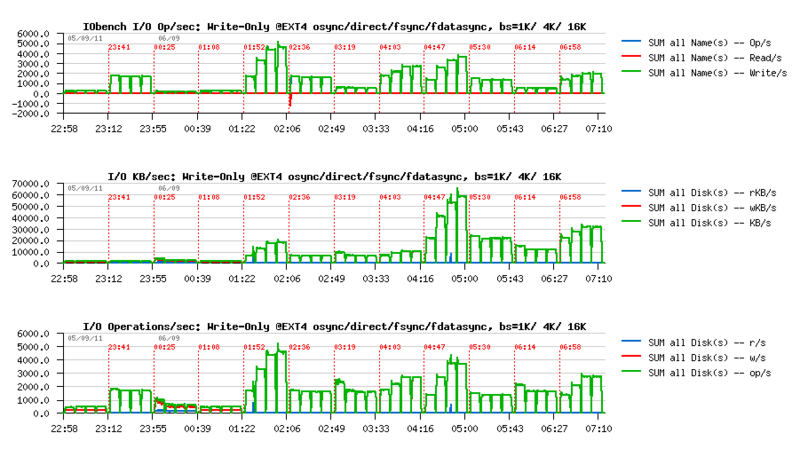 On XFS performance issues started since 16 concurrent IO write processes, so I'm limiting the test cases only to 1, 2, 4, 8 and 16 concurrent write threads (Sysbench is multi-threaded), and for AIO writes seems 2 or 4 write threads may be more than enough as each thread by default is managing 128 AIO write requests..
while XFS is performing more than x2 times better, but getting a huge drop since 16 concurrent threads..
And similar drop since 16 threads.. However, things are changing radically when AIO is used ("async" instead of "sync"). 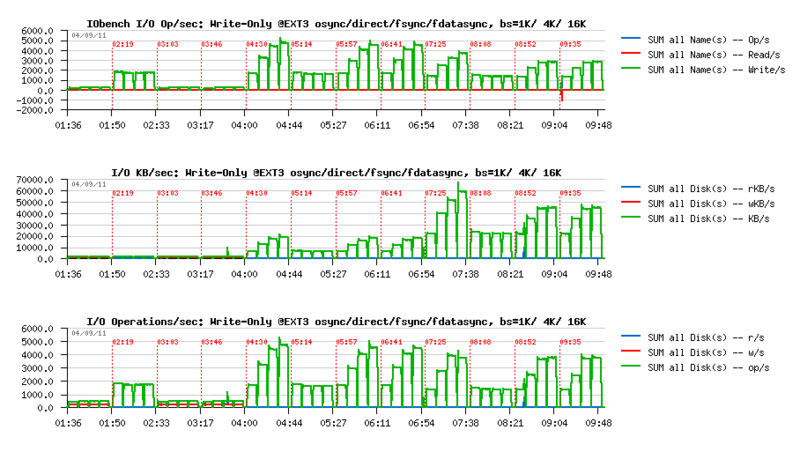 While EXT4 remains stable on all threads levels, and XFS is hitting a regression since 4 threads..
Not too far from the RAW device performance observed before.. 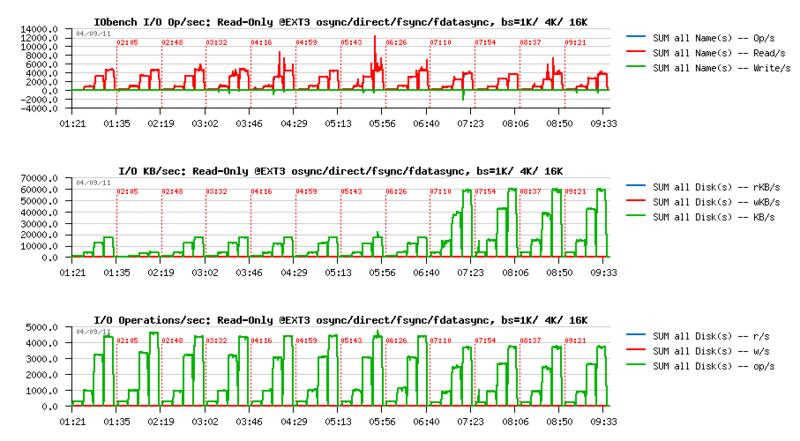 Pretty similar as with 4K results, except that regression on XFS is starting since 8 threads now..
" O_DIRECT (Since Linux 2.4.10)Try to minimize cache effects of the I/O to and from this file. Ingeneral this will degrade performance, but it is useful in specialsituations, such as when applications do their own caching. File I/Ois done directly to/from user space buffers. The O_DIRECT flag on itsown makes at an effort to transfer data synchronously, but does notgive the guarantees of the O_SYNC that data and necessary metadata aretransferred. To guarantee synchronous I/O the O_SYNC must be used inaddition to O_DIRECT. See NOTES below for further discussion. " EXT4 performance become lower.. - 25% a cost for O_SYNC, hmm..
while XFS surprisingly become more stable and don't have a huge drop observed before..
as well, XFS is out performing EXT4 here, while we may still expect some better stability in results.. I'm pretty curious what kind of changes are going within XFS code path when O_SYNC is used in AIO and why it "fixed" initially observed drops.. But seems to me for security reasons O_DIRECT should be used along with O_SYNC within InnoDB (and looking in the source code, seems it's not yet the case, or we should add something like O_DIRECT_SYNC for users who are willing to be more safe with Linux writes, similar to O_DIRECT_NO_FSYNC introduced in MySQL 5.6 for users who are not willing to enforce writes with additional fsync() calls)..
Time to a pure MySQL/InnoDB heavy RW test now.. This article is following the previously published investigation about I/O limitations on Linux and also sharing my data from the steps in investigation of MySQL/InnoDB I/O limitations within RW workloads.. But before to deploy on it any of MySQL test workloads, I want to understand the I/O limits I'm hitting on the lower levels (if any) - first on the card itself, and then on the filesystem levels.. NOTE : in fact I'm not interested here in the best possible "tuning" or "configuring" of the Fusion-io card itself -- I'm mainly interested in the any possible regression on the I/O performance due adding other operational levels, and in the current article my main concern is about a filesystem. The only thing I'm sure in the current step is to not use CFQ I/O scheduler (see previous results), but rather NOOP or DEADLINE instead ("deadline" was used within all the following tests). the worst case is when you have just one big data file within your RDBMS which become very hot in access..
Let's start with raw devices first. By the very first view, I was pretty impressed by the Fusion-io card I've got in my hands: 0.1ms latency on an I/O operation is really good (other SSD drives that I have on the same server are showing 0.3 ms for ex.). However thing may be changes when the I/O load become more heavy..
from the KB/s graph: seems with the 500MB/sec speed we're not far from the max I/O Random-Read level on this configuration..
very interesting results: in this test case performance is constantly growing with a growing load! max I/O Level in throughput is near 1GB/sec.. So, what will change now once a filesystem level is added to the storage??.. while 30K Reads/sec are well present on 16K block size, we're yet very far from 100K max obtained with 4K on raw device..
500MB/s level is well reached on 16K, not on 4K..
the FS block size is also 4K, and it's strange to see a regression from 100K to 70K Reads/sec on 4K block size..
EXT4 performance here is very surprising..
15K Writes/s max on O_DIRECT with 4K, and 10K with 16K (instead of 100K / 60K observed on raw device)..
fsync() test results are looking better, but still very poor comparing to the real storage capacity..
Looks like there is no difference between two cases, and EXT4 is just going on its own speed. 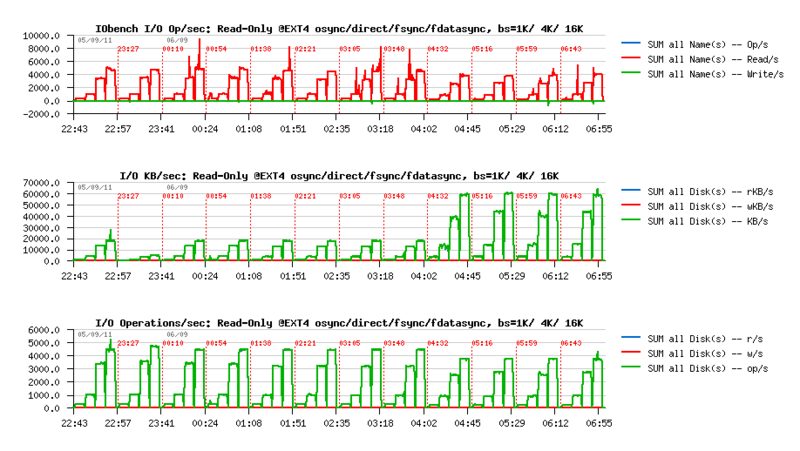 same situation on RWrnd too..
performance is far from "raw device" levels..
on 16K block size there seems to be a random issue (performance did not increase on the beginning, then jumped to 30K Reads.sec -- as the grow up happen in the middle of a test case (64 processes), it makes me thing the issue is random..
well, as I've observed on my previous tests, O_DIRECT is faster on XFS vs write()+fsync()..
however, the most strange is looking a jump on 4 concurrent I/O processes following by a full regression since the number of processes become 16.. 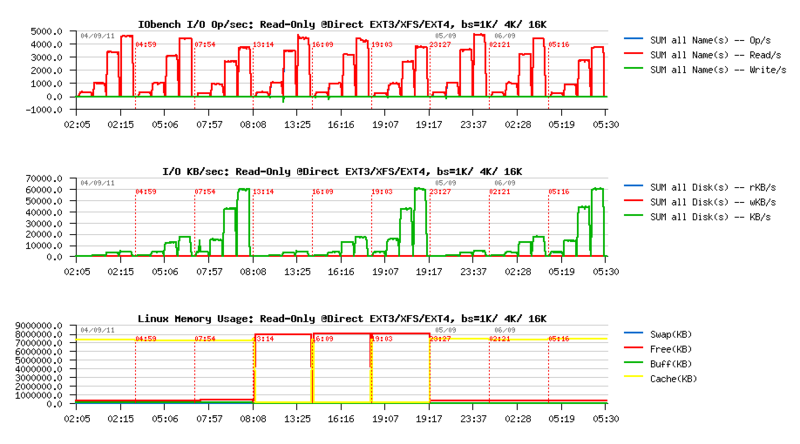 So, looking on all these EXT4 and XFS test results -- it's clear that if in MySQL/InnoDB you have OLTP RW workload which mostly hot on a one particular table (means a single data file if table has no partitions), then regardless all internal contentions you'll already need to resolve within MySQL/InnoDB code, there will be yet a huge limitation coming on the I/O level from the filesystem layer!.. Let's see now if instead of one single 128GB data file, the load will be distributed between 8 files, 16GB in size each. Don't think any comments are needing for the following test results. With 8 data files we're reaching very closely the RAW device performance on write I/O operations, and O_DIRECT option seems to be the must for both EXT4 and XFS filesystems. Let's see now if performance is already better with 2 or 4 data files. confirming once more a true serialization on a file access: each result is near twice as better as the previous one without any difference in results with a growing number of concurrent I/O processes..
only since 4 data files there is no more performance drop since 64 concurrent I/O processes..
while it's way better than EXT4..
on 2 files there is a strange jump on 256 concurrent processes..
but well, with 4 files it looks pretty similar to 8, and seems to be the minimal number of hot files to have to reach RAW performance..
and near x1.5 times better performance than EXT4 too..
and, finally, be sure your write activity is not focused on a single data file! - they should at last be more or equal than 4 to be sure your performance is not lowered from the beginning by the filesystem layer! It was a long time now that I wanted to run some benchmark tests to understand better the surprises I've met in the past with Linux I/O performance during MySQL benchmarks, and finally it happened last year, but I was able to organize and present my results only now..
what is so different with various I/O schedulers in Linux (cfq, noop, deadline) ?.. what is wrong or right with O_DIRECT on Linux ?.. what is making XFS more attractive comparing to EXT3/EXT4 ?.. There were already several posts in the past about impact on MySQL performance when one or another Linux I/O layer feature was used (for ex. Domas about I/O schedulers, Vadim regarding TPCC-like performance, and many other) - but I still did not find any answer WHY (for ex.) 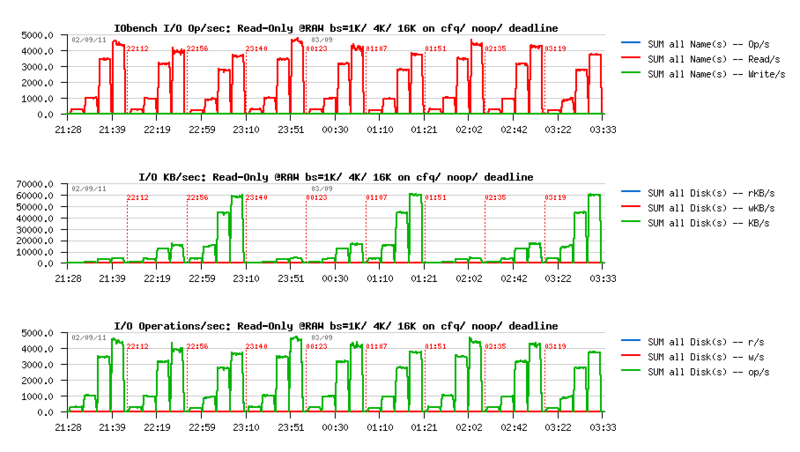 cfq I/O scheduler is worse than noop, etc, etc..
then, based on observed results, setup more optimally each filesystem (ext3, ext4, XFS) and try to understand their bottlenecks..
I/O workload: I'm mainly focusing here on the random reads and random writes - they are the most problematic for any I/O related performance (and particularly painful for databases), while sequential read/writes may be very well optimized on the HW level already and hide any other problems you have..
all your I/O requests (read, write, etc.) block size should be aligned to 512 bytes (e.g. be multiplier of 512 bytes), otherwise your I/O request is simply rejected and you get an error message.. - and regarding to RAW devices it's quite surprising comparing to Solaris for ex. where you're simply instead of /dev/dsk/device using /dev/rdsk/device and may use any block size you want..
then, reading the manual: "The O_DIRECT flag on its own makes at an effort to transfer data synchronously, but does not give the guarantees of the O_SYNC that data and necessary metadata are transferred. To guarantee synchronous I/O the O_SYNC must be used in addition to O_DIRECT" - quite surprising again..
And if you need an example of C or C++ code, instead to show you the mine, there is a great dev page on Fusion-io site. So far, what about my storage performance on the RAW devices now?.. NOTE: I'm using here 1K block size as the smallest "useful" size for databases :-)) then 4K as the most aligned to the Linux page size (4K), and 16K - as the default InnoDB block size until now. 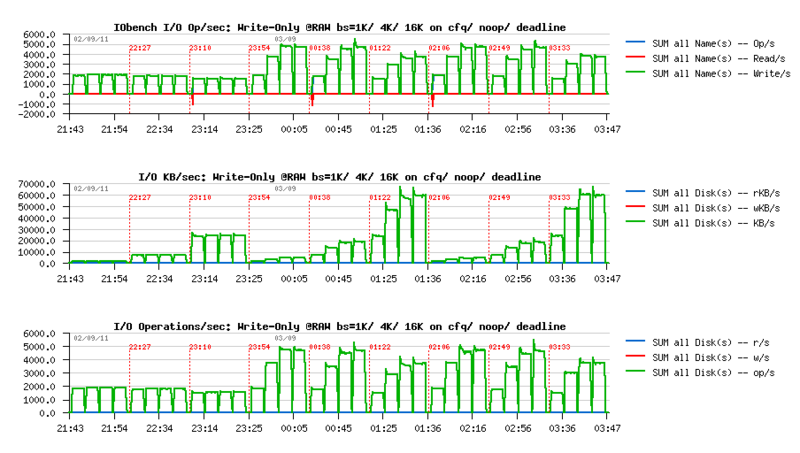 Following graphs are representing 9 tests executed one after one: cfq with 3 different block sizes (1K, 4K, 16K), then noop, then deadline. Each test is running a growing workload of 1, 4, 16, 64 concurrent users (processes) non-stop bombarding my storage subsystem with I/O requests. 1K reads are running slightly faster than 4K (as expected as it's a "normal" disks, and transfer of a bigger data volume reducing an overall performance, which is normal)..
looking on the graph you may easily understand now what is wrong with "cfq" I/O scheduler.. - it's serializing write operations! while "noop" and "deadline" are continuing to scale with a growing workload..
so, it's clear now WHY performance gains were observed by many people on MySQL workloads by simply switching from "cfq" to "noop" or "deadline"
To set "deadline" as default I/ scheduler for all your storage devices you may boot your system with "elevator=deadline" boot option. Interesting that by default many Linux systems used "cfq". All recent Oracle Linux systems are shipped with "deadline" by default. As you understand, there is no more reasons to continue any further tests by using "cfq" I/O scheduler.. - if on the raw level it's already bad, it cannot be better due any filesystem features ;-)) (While I was also told that in recent Linux kernels "cfq" I/O scheduler should perform much more better, let's see).. NOTE: to avoid most of background effects of caching, I've limited an available RAM for FS cache to 8GB only! (all other RAM was allocated to the huge SHM segment with huge pages, so not swappable).. So, let's start now with Read-Only results. 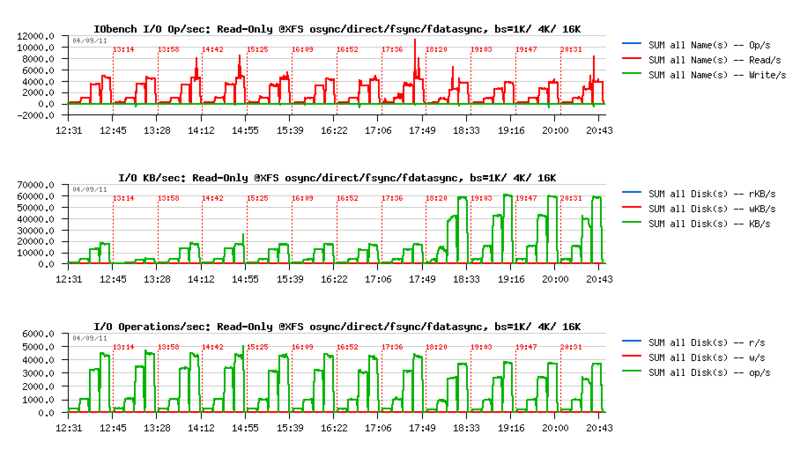 as you may see, only with XFS the filesystem cache usage is near zero! Well, let's see now what is different on the Write Performance. interesting that the highest performance here is obtained with O_SYNC flag, and we're not far from 5000 writes/sec for what the storage is capable..
interesting that only with O_SYNC flag the performance is comparable with EXT3, while in all other cases it's simply worse.. I may suppose here that EXT3 is not flushing on every fsync() or fdatasync(), and that's why it's performing better with these options ;-)) need to investigate here.. But anyway, the result is the result.. I've used a default setup of XFS here, and was curios to not observe the impact of missed "nobarrier" option which was reported by Vadim in the past..
Now, what is the difference between a "default" XFS configuration and "tuned" ??.. Then, keeping in mind that XFS is so well performing on 1K block size, I was curious to see if thing will not go even better if I'll create my XFS filesystem with 1K block size instead of default 4K..
when XFS is created with 1K block size there is no more read-on-write issue on 1K writes..
and we're really writing 1K..
however, the performance is completely poor.. even on 1K writes with O_DIRECT !!! The answer is came from the Random Reads test on the same XFS, created with 1K block size. 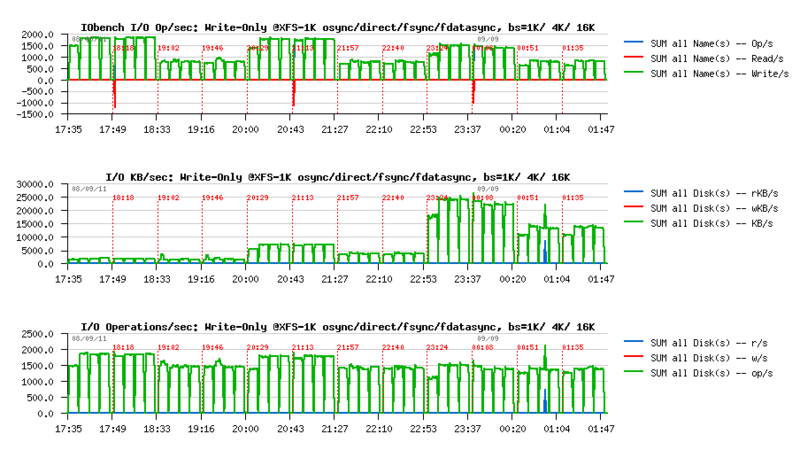 the previously 8GB free RAM is no more free here..
so, XFS is not using O_DIRECT here! and you may see also that for all reads except O_DIRECT, it's reading 4K for every 1K, which is abnormal..
if you've decided to use O_DIRECT flush method in your MySQL server - deploy your data on XFS..
could be very interesting to see similar test results on the other filesystems too..
things may look better with a newer Linux kernel..
MySQL Performance: 5.4 outperforms PostgreSQL 8.3.7 @dbSTRESS ! 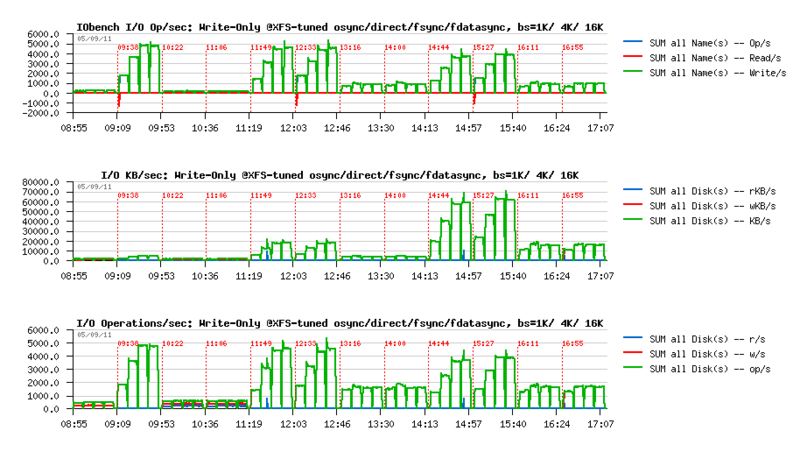 Forget to say, I've also tested PostgreSQL 8.3.7 during the last benchmark serie with dbSTRESS! 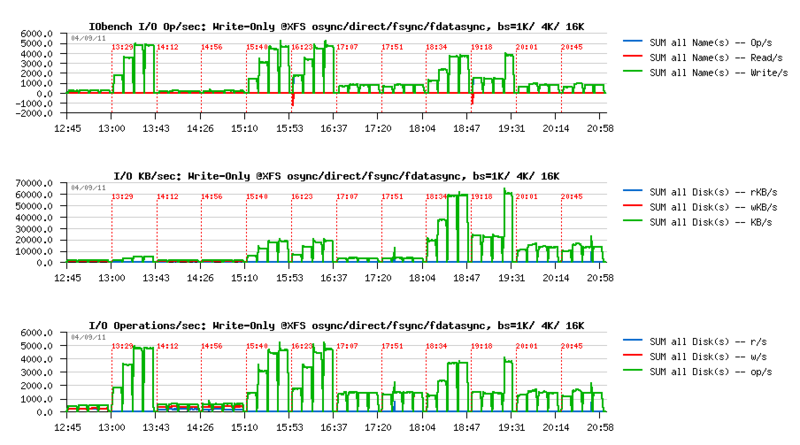 A big surprise - if two years ago on the same workload PostgreSQL was two times faster (see: http://dimitrik.free.fr/db_STRESS_BMK_Part2_ZFS.html ), now it's MySQL 5.4 outperforming PostgreSQL!